Through my online courses on Craftsy, I often get questions about how to start a sketch. I think we all have the same problem when staring at a blank page in a sketchbook. Where do I start? What do I want to capture? What if there’s nothing interesting around me to draw? I think one of the possibilities when you’re staring at that white page is to have one small goal that you would like to work towards. It doesn’t have to be anything overly ambitious, like a complex street scene on a sunny day or a panoramic landscape at sunset. Make it something small, especially if your time is limited or the light is changing quickly. Every sketch is a practice — in fact every painting is a practice — and if you can learn something each time you put pen or brush to paper, then you are making progress even if you haven’t created anything you’d like to hang on the wall. Yesterday I had this unforgettable lake view in front of me but the light was fading fast. There was no central focus in the scene and I knew I wouldn’t have time for a full size watercolour. 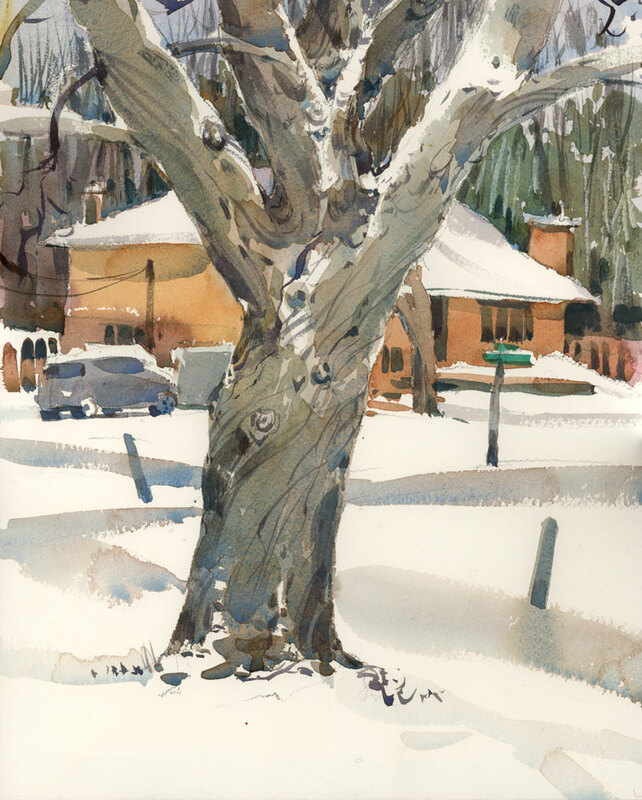 My goal for this quick 8″ x 8″ sketch was simple: separate the distant trees from the close ones using colour temperature (warmer for distant and cooler for the close trees in shadow); paint some interesting tree shapes, different distances apart and each with a slightly different profile (I used my Rosemary dagger brush for that); and finally, get some cool shadows on the snow-covered trees to show them in shadow against the frozen lake. Ok, so that’s not one small goal, it’s actually three. But the point is, the goal wasn’t to make a great painting. It was just a series of exercises within the sketch. And considering the time I had before I lost the light, I’m happy to have had the chance to practice each of them. I’m trying out something new this week. It’s a pad of Arches 140 lb, cold press paper. Not a block that’s glued down on four sides, but a pad that’s only glued on the short side. I was curious to see whether the paper would warp, because I usually tape my sheets to a backing board or use the glued block. This paper surprised me. I painted on it with very wet washes and it remained relatively flat. That’s good news, because I find this format very convenient. I love the ease of throwing the pad in my bag and it’s quite a bit more economical than the blocks (although not as cheap as cutting up your own paper!). Perfect for sketch outings because it comes in both 9″ x 12″ and 10″ x 14″ sizes. The last time I painted on rue Henri Julien was in the fall when the trees formed a yellow canopy over the street. 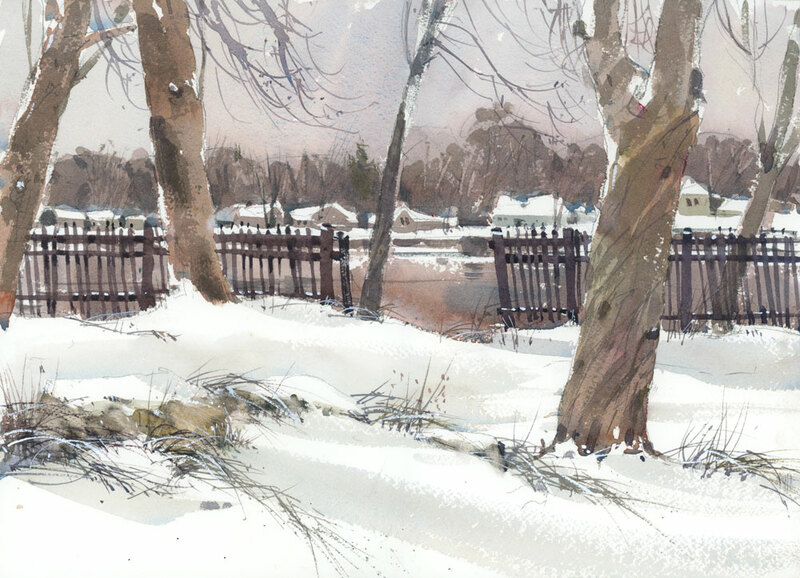 This morning we had a sprinkling of fresh snow and I was hoping that I could paint there again but the weather was not on my side. By the time I parked the thermometer had moved up, and the snow turned to rain so I drew instead. 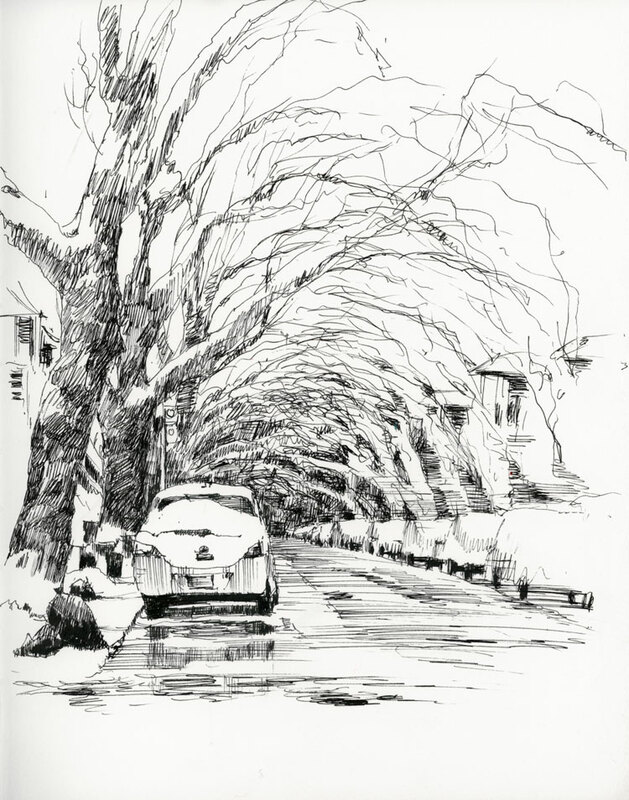 I’m not sorry I drew this in pen though, because I think the dismal day and the soggy snow may come across better in black and white than in colour. 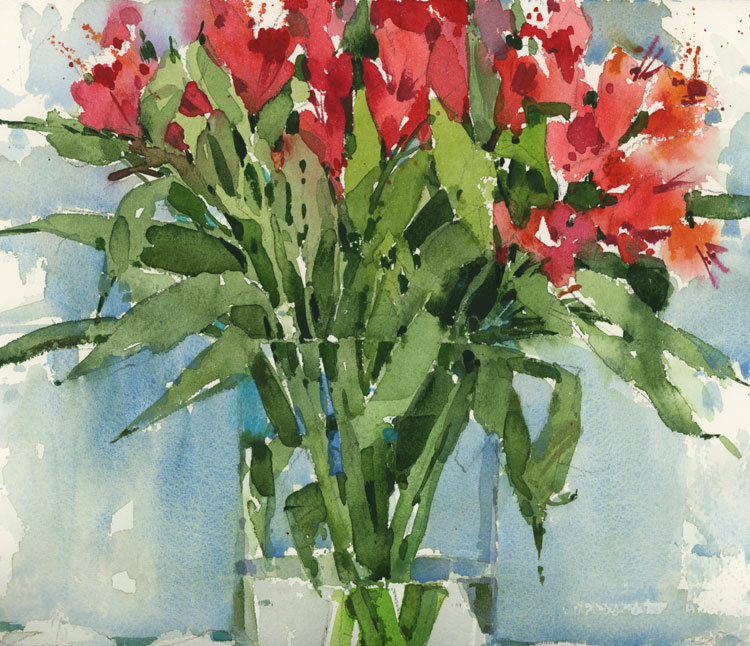 Sketched in a Handbook Watercolor Journal, 9″ x 12″. I’m constantly shifting things around in my palette. A few months ago I took out Sap Green, but for flower painting I find it’s really a necessity. I squeezed out a small blob of it on a corner of my tray, as well as some Deep Sap Green. With the addition of a little yellow there wasn’t much else I had to do to get the right colour for this foliage. Painted on a pad of Arches 140 lb cold press paper, 12″ x 12″. There is an abundance of travel sketch kits, but I bet there aren’t too many of these around anymore. I received this Daniel Smith brass paint kit as a gift years ago but haven’t used it recently for a number of reasons, in particular because I use too much water in my mixes, and my brushes are too big. I took it out this week though, knowing I might need it for restricted-space sketching activities. On the outside it’s a perfectly beautiful object — rectangular, hinged, and with a thick brass closure on one side. Open it up to reveal everything you need for sketching, minus the brush: twelve spots for paint (six more if you add a few half pans in there), a water bottle, a divided reservoir for rinsing your brushes, five enamel mixing surfaces (if you count the water bottle surface) and a hole for your thumb. What more does a sketcher need? I filled it this week with some colours I don’t use often, among them Green Gold, Cendre Blue and Cadmium Orange, just so I could have an alternative to my standard colours. And then I used it this morning when Urban Sketchers Montreal met for our monthly outing, this month at a Dim Sum restaurant. It fits perfectly in my left hand while I sketch, and in places where the table linens are white (and you don’t necessarily want to put your paints on the table) it can rest on your lap. It also works really well when I paint in the car because it balances on the console between the driver’s and the passenger’s seat. It won’t replace the larger palette I use most of the time, but it’s a great alternative for those times when a little furtive sketching is on the menu. I knew where I wanted to paint today couldn’t really find a good spot to park. In one direction I was facing into the sun, and the other side of the street had no parking spots. Since I was out there with my sketch stuff and didn’t want to waste a perfectly good outing, I drew what was out my side window. 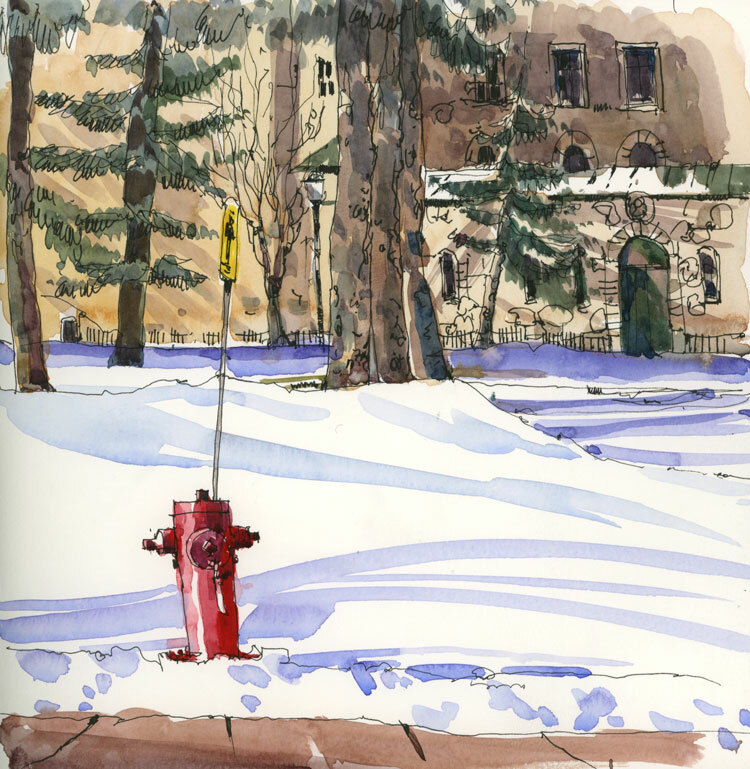 Kind of an odd view with a bit of building and a lot of white but who can resist a fire hydrant in the snow?